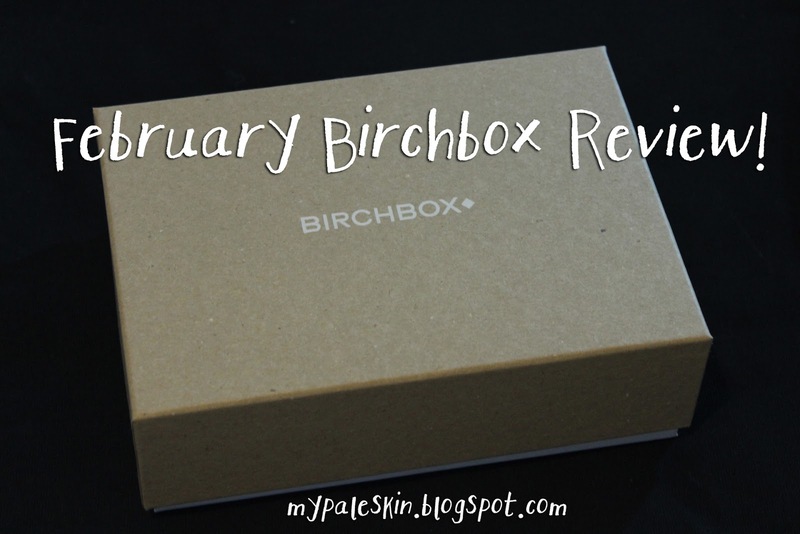 My Pale Skin: [Review] February Birchbox uk! - My first beauty box! [Review] February Birchbox uk! - My first beauty box! So I was super excited to get my first birchbox in the mail! I'm quite into the idea of getting new products every month, it's my present to myself and i'm looking forward to seeing what new lovely little treats I receive. First impressions are good! It's in a very cute sturdy little card box that for some reason, i kind of expected it to bigger? But i'm not complaining, i'm too excited. I'm really digging these postcards! The cardstock is of a good quality and the designs are super cute. It gives some much needed info about the products that are contained in the box. Love this little drawstring bag! it's so cute. I'm sure i can make use of this for storing make up, hair things or little knick knacks. My overall first thought was, hmmmmmmmm. Okay so let's look at the products one by one! So i don't really paint my nails very often... i know, i'm sorry. Mainly because i seem to chip them straight away. Maybe I need to constantly keep redoing them every other day for them to constantly look good? This is a full size nail varnish and a little pot of glitter for dipping your fingers into. Looks promising! I'm going to try this out for sure! This is super cute! It's a mini eyeliner pen that's apparently smudge proof and longlasting! I love eyeliner pens and needed to buy a new one! So i'm really pleased to get this. Looking forward to trying this out. This is a 'para-ben free formula with red tea, grape seed and milk thistle'. I'm not too sure about this. It looks like something you'd find in a hotel bathroom, and after a quick sniff, smells like it too. I'm not that much of a chocolate lover, and I especially dislike dark chocolate. The boyfriends eyes lit up when he saw this one however, so that'll be for him. Oh this looks like it could be useful! I have bleached hair, so am forever worrying about my dry ends, I'm going to try this when I was my hair next! I'm interested to try this out, but my face can be a little fickle with products so i'll have to make sure I fully patch test first to ensure this doesn't break me out before using on my entire face. Overall, my first impressions aren't bad! I really like the eyeliner, and hair oil & i'm looking forward to trying the nail polish. The boyfriend likes the chocolate, the others, the facial scrub i'll have to test but the shower gel... meh. I'll stick to my Original Source.